Hurry up and put it out. Some of the animation looks a little stiff but overall I'm really looking forward to this one. What the hell is with that animation? The animation does bum me out a bit, but the artwork is great, and I'll still buy day one. Might not be interpolated yet. Also, this is straight to video? Not coming to theaters? Huh. The animation looks more like one of those "Motion comics" than a DC video release, which are traditionally great. All of their DC animated movies are straight to video. True, true. It's just this is such a big release. Wasted opportunity imo. Yeah, thinking they have some more 'tweens to stick in there. Or some of those sequences were flashbacks? Hopefully they don't skimp on this. I think it's a given if they would have put it out in theatrical release the execs at WB would've pushed for edits to get it down to a PG-13. I think it's more likely that it wouldn't see a theatrical release due to contract limitations. They probably don't want it competing with Suicide Squad and the rest planned. It's not gonna though. A limited theatrical release wouldn't have hurt anyone, i just reckon they don't think there was money to be made. Hard to tell if that was a trailer for Batman or Cell. Contract limitations? WB owns and is producing both of those projects, so I'm not entirely sure what you're getting at. Realistically, there are already a shitload of comic book/superhero movies coming out this year...and this would not only have to compete with those, but also deal with the stigma animation still has in the States. People still can't grasp the concept that animation does not automatically mean it's for children. 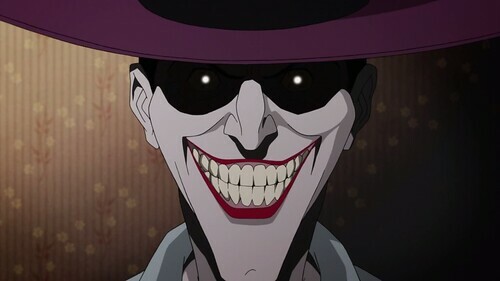 I imagine there would be ridiculous amounts of backlash from uninformed parents taking their children to see a "kid-friendly" (because it's animated, you see) Batman movie...that is actually R-rated and violent. It just makes more sense to keep it as straight to video. I could see a limited theatrical release...but, would it be worth the effort and expenditure when compared to the demand?